The series was mostly filmed and located in and around sixties London. Indeed, Strange’s preferred mode of transport is his own self driven old black London taxi cab. Each of the sixteen one hour episodes is given a case reference number ranging from ‘Report 0649 to Report 8944’. The eponymous title character is portrayed by Anthony Quayle. This was his first television series – Quayle was previously well known for his theatre work (particularly with the Royal Shakespeare Company) and major films such as Ice Cold in Alex, The Guns of Navarone and Lawrence of Arabia. Sir Lew’s ITC always had one eye on the profitable US market and with this in mind, the series was made using 35mm colour film stock. It also featured American actor Kaz Garas, playing Strange’s forensic assistant Ham Gynt. Strange is also helped by his young artist friend and neighbour Evelyn (former Dr Who actress Anneke Wills). The trio work well together and are rewarded with good scripts and supporting guest stars including Robert Hardy, Martin Shaw, Kay Walsh, John Thaw, Leo Genn, Ian Ogilvy and Sylvia Syms. 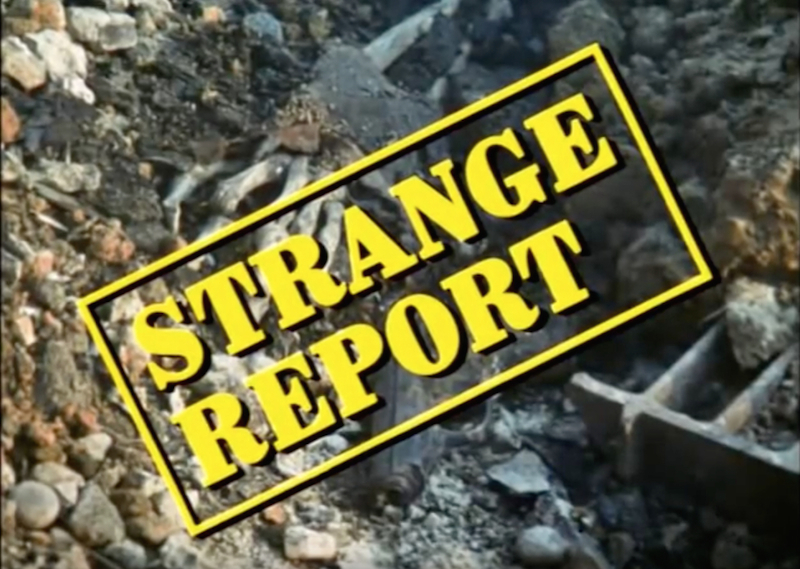 In addition, Strange Report has a catchy theme tune composed by Roger Webb. There were plans to make a further series with the production relocating to the USA. However, both Quayle and Wills were not keen on going stateside, so disappointingly the second series didn’t materialise. What we do have is sixteen stylish well written and entertaining stories covering organ transplants, robbery, student protests, murder, the fashion business, a charity cult, the Cold War, racism, people smuggling and witchcraft. The plots stand up well over forty years later, with sadly the ones focusing on human trafficking and racist political parties still very topical. ‘Report 3424: Epidemic’, written by Don Brinkley and directed by Daniel Petrie, focuses on a cholera outbreak amongst an immigrant community in London. The plot exposes the mercenary approach of the people traffickers (led by Peter Vaughan) and their total disregard for the lives of those they smuggle into Britain. Saeed Jaffrey and Zienia (Space 1999) Merton co-star. The complete series of Strange Report is available as a Region 2 boxset quite cheaply (at the time of going to print, it was £14 in the UK, and $21.51 on import in the US).